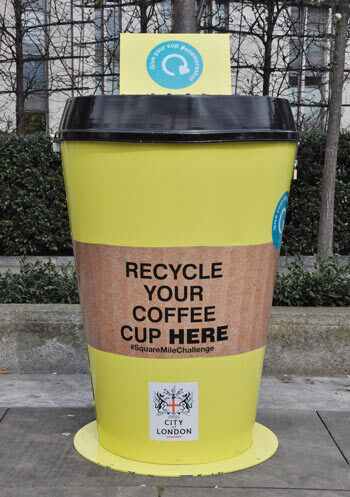 Workers in the City of London are being urged to use brand new coffee cup recycling points springing up across the area as Hubbub’s ‘Square Mile Challenge’ aims to recycle half a million cups in April. The scheme, led by environmental behaviour change charity Hubbub in partnership with recycling company Simply Cups, was launched today (3 April) across London’s Square Mile, the most densely-officed area in the UK. Collection points have been placed in the streets, stations and office blocks after the scheme was backed by the City of London Corporation, Network Rail, national coffee companies and many of the area’s largest employers. Around 2.5 billion takeaway coffee cups are thrown away in the UK every year – 5,000 a minute – many by busy commuters on their way to or from work. Due to the complex structure of the cups meaning they aren’t compatible with traditional paper recycling streams however, only around six million of these cups are recycled annually, less than 0.25 per cent. By introducing recycling facilities across the City of London, home to around 18,000 businesses employing over 450,000 people, Hubbub hopes to recycle 500,000 cups throughout April, with five million extra cups collected by the end of 2017. 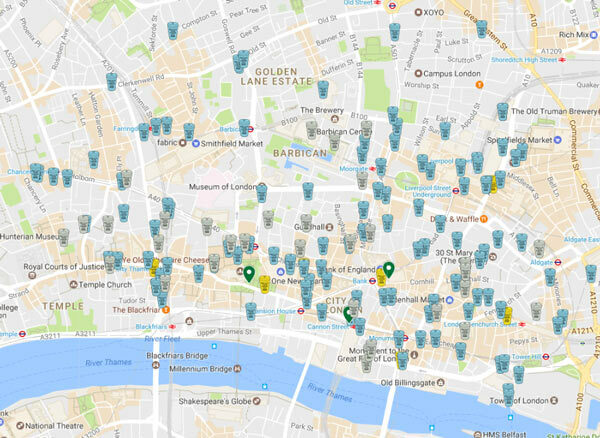 Hubbub has created an interactive map of all of the recycling facilities being placed in the city, including those in coffee stores, company premises, stations and on the street. Since the challenge was announced in January over 30 organisations based in the city, including Lloyd’s of London, Deloitte, Prudential, the Barbican Centre and Kings College London, have signed up to collect cups in their offices. These cups will then be collected by Simply Cups and recycled into either a mouldable plastic or recovered fibre material used to make new products, some of which will be donated to a new outdoor community space and café opening in the city next year. In addition to the businesses and premises taking on cup collections (a full list of which can be found at the bottom of this page), over 100 high street coffee retailers are offering recycling facilities and accepting coffee cups in their stores, regardless of where they were purchased. Square Mile Challenge bins in the shape of bright yellow coffee cups have also been placed on the City’s streets and cups will be collected at both Liverpool Street and Cannon Street stations during rush hour every weekday throughout the month. Steve Presland, the City of London Corporation’s Highways and Cleansing Director, says that the authority, which provides local government and policing services for the Square Mile, is committed to maintaining London’s position as the world’s leading financial and professional services centre, adding that “a big part of this is ensuring that we manage our waste both sustainably and responsibly”. “We spend £3.8million a year cleaning the city’s streets and more than 400,000 people commute and into the City of London every day,” says Presland. “It’s great to see the range of businesses that have signed up so far to the challenge, and we look forward to seeing more joining throughout the campaign. Last week, a study carried out by Cardiff University on behalf of coffee manufacturer Bewley’s found that up to 300 million cups would be saved with the introduction of simple initiatives like clear environmental messaging in stores, a charge on disposable cups and measures to increase the use of reusable cups. The research found that adding a charge for disposable cups increased the use of reusable cups by 3.4 per cent and distributing free reusable cups increased use by 4.3 per cent. Environmental messaging and simply making reusable cups available increased use by 2.3 and 2.5 per cent respectively. However, by combining the measures, the study found that the use of reusable cups increased much more significantly, going from 5.1 per cent to 17.4 per cent in one café. However, Ellis says that a range of approaches must be taken to ensure that the vast amounts of cups that would still be used are sustainably disposed of: “It would be easy to suggest that everyone should use reusable cups for our hot drinks, but the reality is that disposable cups are being used in their millions and so we have to deliver a solution to this issue. More information about the Square Mile Challenge can be found on the scheme’s website. The UK’s most heavily-concentrated area of offices is to be targeted for Hubbub’s Square Mile Challenge, providing specialist bins to boost the recycling of takeaway coffee cups. Simple steps like charges and environmental messaging could reduce the use of disposable coffee cups by 50 to 300 million per year, according to new research. A new social experiment in Manchester is to test a series of bins to see if the collection of coffee cups could be effectively recycled into new products.